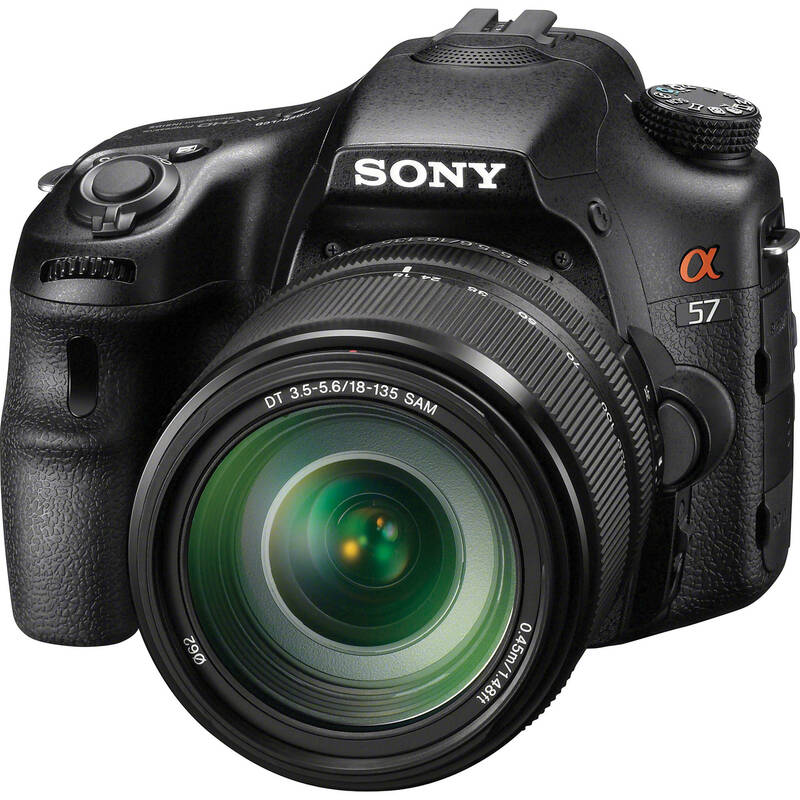 The Alpha SLT-A57 DSLR Digital Camera with 18-135mm Lens from Sony combines the quality and control akin to a professional DSLR and pairs it with the convenience and efficiency of a point and shoot camera. This melding of technologies allows you to make outstanding imagery with a simplistic interface and functionality. Featuring a 16.1 MP Exmor APS HD CMOS sensor, this camera is able to capture high quality stills and video with excellent low-light sensitivity. It also features Translucent Mirror Technology for continuous AF monitoring, permitting you ensured sharpness when recording full HD 1080p video or photographing at up to 12 fps. This quickened performance carries over into a number of features that are designed specifically for capturing the best images possible without you having to be concerned with over specific camera settings. Auto Portrait Framing is a unique mode that automatically recognizes portrait situations and creates balanced portraits based around the characteristics of your subject. It utilizes a number of other modes, including Face Detection, Smile Shutter, and Face Registration, and creates an appealing composition based on where your subject is located within the frame, where they are looking, and how they are being lit. Clear Image Zoom is also employed in Auto Portrait Framing, and is able to zoom the center of your image up to 2x with almost no noticeable image degradation. The SLT-A57 comes with the new Sony 18-135mm zoom lens which provides a very long focal range, covering the most frequently used focal lengths and offering coverage for almost all of your shooting needs. The lens is compact and easy to handle and having one lens cover such a range of focal lengths means safety: you won't drop a lens that you don't have to change and convenience: you won't miss a shot while changing lenses. Sony's Direct Manual Focus (DMF) allows you to switch between AF and MF without removing your eyes from the viewfinder and Smooth Autofocus Motor (SAM) offers a quiet, gliding AF mechanism, which also improves AF response when shooting moving subjects. With a single ED glass lens element and two aspherical lens elements, quality images with little color aberration are assured in any setting. Versatile and compact, the 18-135mm lens is the perfect complement to the high quality SLT-A57 and combined, they provide you with DSLR quality images from a manageable, easy to use and affordable camera system. With Translucent Mirror Technology, the SLT-A57 directs light to both the image sensor and the Phase Detection AF sensor simultaneously. This is the foundation for the camera's many high speed functions. Utilizing the Translucent Mirror Technology, the autofocus system is able to continuously monitor the image frame and alter the autofocus quickly and responsively. This continuous focusing is especially useful when critical focus is required during video recording or when shooting in continuous modes. It uses 15 points, including 3 cross sensors for accuracy and speed when determining focus points. This focusing efficiency is even highly capable under low-light situations and when used while tracking moving subjects. The 16.1MP APS Exmor HD CMOS sensor provides a high level of image quality and additional low-light sensitivity benefits. This sensor allows for an extended ISO range from 100 to 16000 while effectively reducing noise at higher sensitivities. This combination of sensitivity and reduced noise make this camera ideal for action photography, indoor use or at night. The Sony 18-135mm f/3.5-5.6 AF zoom lens is included with this camera, providing you with a huge focal range for a wide variety of situations. It features Sony's smooth autofocus motor for quiet operation, which is especially useful when recording video. It is ultra compact too, for easy portability. Full HD 1080p video recording is supported with this camera and also makes use of the high-speed Translucent Mirror Technology for continuous autofocus, even while using Live View to monitor your shooting. The AVCHD version 2.0 (Progressive) format allows recording of 60 frames per second for outstanding clarity and motion detail. Additionally, the 24p frame rate is supported allowing you to create movies with a more cinematic feel. This slower rate is the same that is used in movie theater playback and gives an inherently cinematic look and feel to your movies. For even greater control over video recording, fully manual shooting modes allow you control over your aperture and shutter speed. The rear 3.0" LCD features Sony's TruBlack technology for increased clarity and resistance to reflections. It has a 921,600-dot resolution for sharp, vivid imagery when reviewing images or monitoring your recording while using Live View. The monitor also features Shot Result Preview, for previewing the effects of your camera's settings before the exposure is made. For even greater viewing possibilities while shooting, the screen is able to tilt up to 180° vertically and rotate up to 270° horizontally. The range of movements and reflection protection give you a wide variety of viewing and shooting angles in difficult lighting conditions. Sony's SteadyShot INSIDE technology for image stabilization within the camera reduces camera shake at the camera level not the lens. You can achieve shake compensation equal to 2.5-4.5 stops in shutter speed. This technology is compatible with any Sony Alpha lens. Panoramic images are simple to create with this mode; simply pan your camera across the scene and the camera will automatically stitch together several images into one seamless panoramic file. 3D Sweep Panorama is also supported, and functions with the same convenience, but automatically creates a stereoscopic image for 3D viewing on an HDMI-compliant 3D television. When this mode is selected, three separate bracketed exposures are made at a time and then automatically composited into a single file. This file combines the best highlight detail from one shot, the best mid-tones from a second and the best shadow detail from a third for one incredible shot. Unlike traditional high dynamic range capture, this mode does not require the use of a tripod and simplifies the entire process into a simple, in-camera function. These modes all help to simplify the process of creating the best exposure possible, allowing you focus on composition and not camera settings. Superior Auto mode automatically detects the scene you are photographing and adjusts the camera settings to give ideal results. It also is capable of activating continuous shooting modes for moving subjects and Auto HDR mode if the dynamic range is beyond that of a single frame. Scene Selection affords you a bit more control and allows you to determine the type of scene you are photographing; the camera settings are then adjusted based on your decision. Exposure mode also allows you to select the type of image you are trying to create and then applies settings in-camera to compensate for the difficulties of that given situation. A variety of effects are supported for in-camera image-processing and creative applications. These effects include HDR Painting, Soft Focus, Miniature, Soft High-key, Pop Color, Partial Color (Red, Green, Blue, Yellow), Rich-tone Monochrome, Toy Camera, High Contrast Monochrome, Posterization (Color), Posterization (Black & White), and Retro Photo. Box Dimensions (LxWxH) 9.2 x 7.2 x 7.7"
Alpha SLT-A57 DSLR Digital Camera with 18-135mm Lens is rated 4.4 out of 5 by 7. Rated 2 out of 5 by CLB from Nice camera but too much noise This was my first DSLR I purchased. It was extremely easy to use and very fast. Video quality was okay, not very sharp, but better than the Nikon (more expensive) cameras I tried out. One of the two problems I've had with this camera is the large amount of noise at ISO 800 and over. This camera is not good for low light. It's not good for very bright sunlight either as the entire image becomes washed out if taken facing very bright sunlight. Another issue I've had was that the camera's contrast is too high and the color too fake. I lowered the contrast and changed the vivid setting of the camera. The photos were better but still not acceptable for me. Rated 4 out of 5 by Ryan S. from Love the VIDEO! What can I say. I just love this camera. Now note, I'm more of a videographer and I that's my main focus with this camera. Like most videographers I've been on a quest for years to obtain a video camera which records images that look more like film. DSLR cameras can now do that fairly well for a couple of key reason. #1 being chip size. The chips in DSLR video cameras are very close to the size of an actual 35mm film frame, whereas every other video camera of comparable cost has chip that are 1/4 or and 1/8 the size of a 35 mm film frame. So the resolution and depth of field that you can achieve with these cameras is an incredible jump in quality. #2 DSLR cameras give you a large, inter-changeable, and high quality lens to work with. No more squeezing light thru tiny plastic lenses. These lens are also another HUGE factor in enabling you to obtain shallow depth of focus (i.e. back ground details are out of focus, while your subject is in sharp focus). That is something that just couldn't be easily achieved with prosumer level cameras just a few years ago. So those things aside, these sony camera's are the cream of the crop in DSLR video cameras in my mind. They're high quality, reliable, easy to use controls, and the auto focus technology that the Sony Alpha cameras have, is unique among the brands. So if you are using them for documentary or reality shooting, the ability to switch to auto-focus is VERY nice. Did I also mention this camera takes a great photograph? No? Oh yeah well it does indeed! Rated 5 out of 5 by Geoff from Great camera/lens combo I decided to upgrade my technology from a Nikon D40 kit, and a friend recommended Sony. After much investigation, I decided to get this combo for the A57's ergonomics and features, and the range, fast, accurate AF and balance of the 18-135 on the A57 body. I find the IQ to be excellent, with great colors, the A57's features are fun to use, and I'm now a convert to EVF. As the len's max aperture is f/3.5-5.6, I will get the Sony 35mm f/1.8 for low light and interior photography. I also have an extra battery shipping. B&H service, as always, is great. Rated 5 out of 5 by Careful Analysis from No complaints This camera is an excellent tool. It does everything well. The in-body antishake is probably not quite as effective as in-lens, but it's adequate. The color, exposure and white balance on the jpegs are excellent even at default settings -- much better than the Nikon d5100 which I returned pronto for these reasons. I could only live with the crippled interface of the Nikon if it did these things consistenly well. Which it didn't. I opted for the Sony because I thought if I have to adjust these settings anyway I might as well have direct access to these settings with buttons and shortcut menus and full-time live-view so I could pre-adjust the look of the photo. Well all of this the Sony allows very well, but as it turns out it does a better job than the Nikon of taking a prettier picture right out of the box. The 18-135 lens is also a pleasant surprise. It focuses quickly and accurately and is very, very sharp in the centers. It's sharper in the centers than the Minolta 50mm f/1.4 and f/1.7 at 50mm at all comparable apertures; and it's sharper than the Minolta 35-70mm f/4 at all comparable focal lengths and apertures except wide open at 70mm (by a shade). And it does pretty well with close focusing (a .25x ratio) and at 135mm it gives you a nice working distance. Rated 5 out of 5 by AMP from Really good camera! How i'm using this product? I'm enjoying it. It's really most enjoyable camera I ever had. Easy to use in every aspect. Also it is great fun! I want to say thank you, to SONY and B&H. Price is good, delivery also fast. What else I need. May be a good health? But it is not service you provide. Rated 5 out of 5 by Aristeu from A new beggining Its a very nice product to ones like me that dont understando a lot of photography and would like to pay a lower price for a very good product. As soon as i learn how to use i will improve and buy some equipments to upgrade my photos. Rated 5 out of 5 by PhotoMa from Faster Shutter, Truer Color, Cheaper I am not a photog, but I do want great photos of my friends and family. This shutter is unbelievably fast. The color is more vibrant than both competitors. And the price is a slam dunk. Love this purchase.